TICKETS ONLY AVAILABLE AT THE DOOR. WILL SELL OUT! REGISTER EARLY! In February, we enjoyed great success with our very first Meet Your Match Party- a non-intimidating party where singles actually learned something about the person they were meeting. 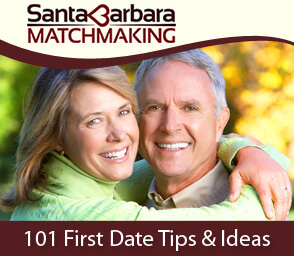 Don’t miss your chance to be a part of this upcoming event with other singles from Santa Barbara and surrounding areas. 1 complimentary beverage for each guest! 1 Free raffle ticket at the door (2 if pre-paid online)! Great prizes, and the opportunity to massively mix, mingle, make new friends, and who knows what else! Men and women get two cards with 5 questions on each card. Answer the questions on both of your cards. Your goal is to go find someone and ask them the questions to see if your answers match. If you have 3 or 4 matching answers, collect one raffle ticket each for the prize drawings, then go look for another match! If you find someone you like, stay and talk for a bit! Throughout your quest you’ll meet many new people! Call (805) 699-5650 or email for more information. THE CROWD FROM PREVIOUS EVENTS! PRIZES YOU CAN WIN ON ………………. One – pair of dangling Sterling Silver Earrings with Amber Beads from Calla Gold Jewelry ($45 value) Calla Gold is the designer at Calla Gold Jewelry here in Santa Barbara. She’ll design it, fix it or find that perfect piece of jewelry for you! Examples of what to expect in your bouquet: Kale, Chard, Arugula, Parsley, Cilantro, Mixed Greens, Bok Choi, Lettuce (multiple varieties), and Spinach! You have less than 10 seconds to make a first impression…make it count! Do you have the WOW factor!? Put your best foot forward for your potential mate. Experience the enhanced feelings of empowerment and confidence that your own personal, individualized makeover can bring you. Click each link below to read each article!